Kalyan Silks is one of the leading providers of the finest collection of designer silks saris throughout Kerala. 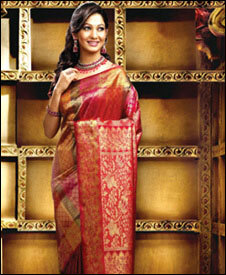 They have world largest silk saree show rooms all over Kerala and located in Thrissur, Ernakulam, Palakkad. Kalyan Silks showcases are also filled with the vast collections of ladies’ ready-mades, modern party wear, kid’s wear, men’s wear and textiles. Kalyan Collections – is the biggest wholesale division in South India. Kalyan Silks is planning to start new outlets in Kannur, Kottayam, Trivandrum and the Middle East. Kalyan Silks brings you designer collections from all over the nation. They features fabulous saris from the designer collections of Chayamukhi, Saugandhika, Tarom ki barat.